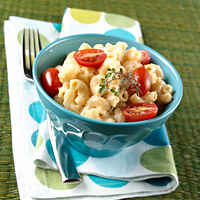 What could be better than a warm bowl of mac and cheese on a chilly evening? This recipe offers a healthy twist on a favorite dish, but still has the rich flavors you're craving. For extra veggies, stir a big handful of chopped spinach into your casserole dish before baking. Comfort food without the guilt? Now that's a bite worth taking. Cook macaroni according to package directions. Meanwhile, blend cottage cheese in a food processor until smooth. Set aside. In a large saucepan over a medium heat, combine oil, flour, pepper and garlic powder; stir until mixed. Gradually stir in the milk and bring to a boil. Cook for 2 minutes or until thickened and smooth. Add the blended cottage cheese and cheddar cheese, stirring until melted. Spray a 2-quart casserole dish with cooking spray. After the macaroni has been cooked and drained, place it in the prepared casserole dish. Pour the cheese mixture over the macaroni and mix until blended. Bake at 350 F for about 30 minutes or until heated through. Top with tomatoes just before serving.